Baan Fah Rim Haad Village, Jomtien Beach. 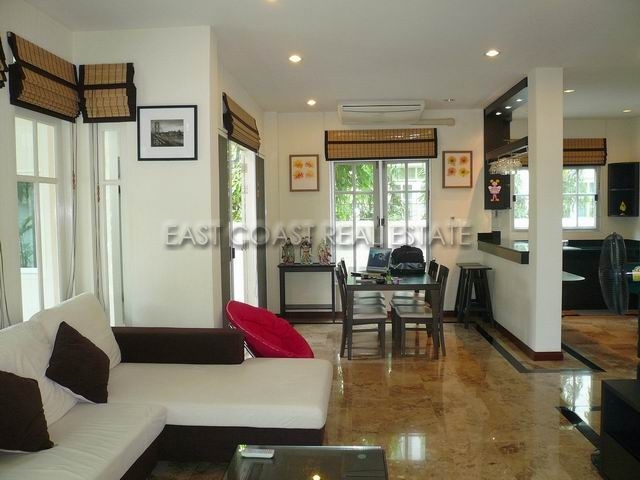 A 3 bedroom, 3 bath house just minutes from Jomtien beach in a landscaped, secure village. This 180 sqm home is fully finished and has marble flooring throughout the downstairs and wood flooring upstairs, European and Thai kitchens, 2 en-suite bathrooms, with the master having an over sized bathtub. There is also a smaller downstairs fourth bedroom/office/den which makes for a very practical feature. The village has a communal pool, 24 hour security, wide internal roads and children's play area. Available for rent with a minimum 1 year contract at 35,000 and 2 month deposit. The house is also for sale with title deed held under company name, so no expensive transfer costs.